mairuru: Thank you very much for your comments! I'm very happy with my little Tomato. She eats very well and is getting bigger every day. 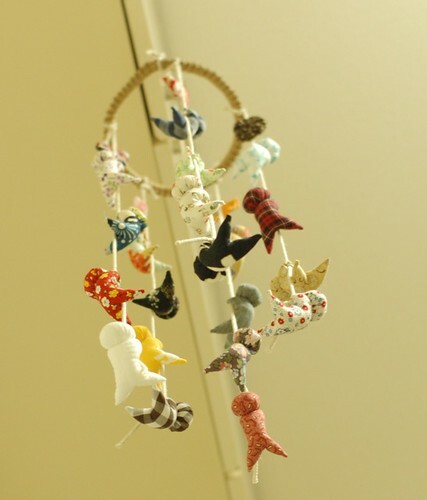 This is a mobile what I made for her before her birth. I also sewed some dresses for her. Next time, I'll show them. The mobile is so cute! Did you get the pattern online or did you make it? happy life to you and all you family. Tomato looks adorable and very healthy. Congratulations! The mobile is darling, I bet Tomato loves it! You don't need to apologize for the post length. All of the mommies that read understand just how busy you are with a new baby, and I'm sure all of the non-mommies can guess. I can't wait to see the dresses you made, even though I'm already sure I love them. Your daugther is adorable :-) and the mobile is cute. Congrats! :) Your Tomato is so cute! She is so lucky to have you as mother. Tomato is so cute! She looks very contented sleeping there under the mobile. What a beautiful girl. She's adorable. She looks so, so beautiful. 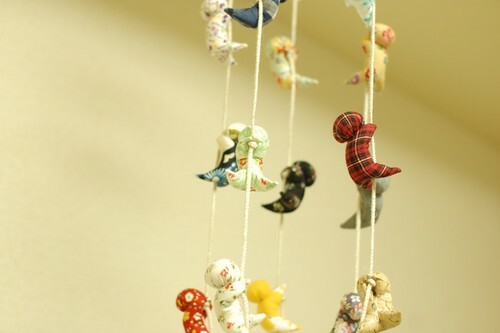 And that mobile is very cute! Oh Mai---What a little sweetie! How lovely...this special time in life...enjoy every moment!! She is so beautiful!!! Congratulations!!! Ohh I'm very happy for you and your Baby.. I follow your sweet photos and history from Italy.. Welcome to the world, little Tomato! She's darling!!!!!!!!!!!! Really a beauty! I love your mobile, too! Congratulations. Your Tomato is beautiful. And the mobile is very cute. Happy life to your family! Aww! Tomato is so cute! I'm dying to know if that's going to be her real name :D I hope she enjoys all the things you made for her!! she is lovely !!.. and the mobile its beutiful.. you made beautiful cute things..
the mobile also great!! :) congrats mai. take care. Little Tomato is so adorable - I love it when babies sleep with their arms up like that. It makes me think they feel secure and loved. I like the mobile's colors!! I am so happy all are well. Congratulations for your Tomato!!! She is perfect!! The mobile is so colourful and pretty. Congratulations! May God bless you and your family. soooo cute: your tomato and the sarubobo mobile! have a sooooo good day! Don't apologize...Now you have Tomato!!! Everything you sew is lovely - and little Tomato is more lovely! God bless. ı love the mobile bur especially your tomato so much! she's really so cute! That's your very best project! Congratulations! Can't wait to see the things you made for her. The mobile is enchanting. And glad you can cuddle beside her on the futon. The mobile is so cute! Congratulations - she is beautiful. Congratulations Mai! I am very happy for you, your little tomato is gorgeous. Two more months and I'll meet my little girl, can't wait. I have just found your blog, tomato is so perfect and she looks really lovely. It is a lovely time for you and your family, enjoy every second of this happiness. I am a big fan of hand sewing, your blog is so informative and represents japanese crafts beautifully. take care of yourself, your husband and baby tomato. How sweet! She is so beautiful. I'm glad all is well. Love the mobil. Congratulations Mairuru...we miss your tutes and the lovely stuff u made, but your "Tomato" is adorable. You'd been preparing stuff for her much before she was born I'm sure you're having a great time with her.Take good care of yourselves and can't wait to see the dresses. I was picking little cherry tomatoes in my garden, here in Wisconsin, and it made me think of your Tomato ^-^. Congratulations! You are going to be a wonderful mom! I have been moved by your gentle and reverential approach to life and loving. Tomato is so precious! She is so healthy looking. Her sarubobo mobile is really cute. And that mobile is so cute. Thank you for posting. What a beautiful girl she is! And she's got a lot of hair too! Are you still eating a lot of tomatos? What's her name? I'm sure it sounds beautiful! What a beautiful and precious tomato. Your most perfect creation. Congrats. She looks so little and sweet! I am sure you are having a most lovely time together! The mobile is delightful! and cute mobile, I am working on one for my baby "Z," she'll be 3 months next week. Hello Mai, baby is beautiful and she's going to be spoilt rotten with mum's lovely gifts. Great inventiveness, but I expect that doesn't mean that the subjects will be entirely split between the sites as a web designer AND developer, this is the grounds why I like this website so much. Not various blogs have this nice flow between both subjects, so continue and good luck with the fresh site also. For my part one and all have to go through this.